Is your skin thirsty ? Well sure it is ! And we have the moisture rescue 911 right here ! Once you start using our bio-hydrate line...The results will be obvious & you will notice the difference ! 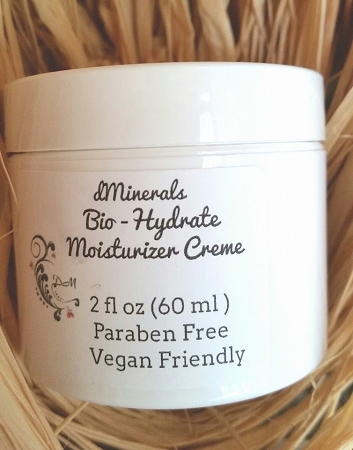 Our Bio-Hydrate Moisturizer will show your skin lots of love ! Hyaluronic Acid will get right to work on plumping that skin to help bring back a more youthful skin ! This is a gentle and safe way to beautiful skin ! helps the skins ph balance as well as other things ! about Tamanu.It contains an antibiotic lactone,calophyllic acid and calophyllic which is an anti-inflammatory. It has been used for diffent skin issues including acne,eczema,wrinkles and much more. It improves joint flexibility also helps to produce flexible muscle and skin tissue & it's a great anti-inflammatory. WOW what a moisturizer ! And just think about all the other ingredients we didn't even talk about ! So PLUMP IT UP BABY ! with our Bio-Hydrate Line ! Ingredients: Organic Herbal Infusion, Organic Barbadensis Leaf Juice (Aloe), Pelargonium Graveolens (Geranium Distillate), Isopropyl Palmitate (Palm Oil), Organic Helianthus Annuus (Sunflower Oil), Kosher Vegetable Glycerin, Glyceryl Stearate, Octyl Palmitate, Stearic Acid, Organic Cocos Nucifera (Coconut Oil), Organic Carthamus Tinctorius (Safflower Oil), Theobroma Cacao (Cocoa Butter), Cetyl Alcohol, Potassium Stearate, Organic Beeswax, Amino Acid Blend (Sodium L-Pyrrolidone Carboxylate, Sodium Lactate, LArginine, L-Aspartic Acid, L-Pyrrolidonecarboxylic Acid, Glycine, L-Alanine, L-Serine, L-Valine, L-Proline, L-threonine, L-Isoleucine, L-Histidine, L-Phenylalanine), Organic Simmondsia Chinensis (Jojoba Oil), Butyrospermum Parkii (Shea Butter), Calophyllum Inophyllum (Tamanu Oil), Organic Borago Officinalis (Borage Oil), Organic Linum Usitatissimum (Flax Seed Oil), Organic Oenothera Biennis (Evening Primrose Oil), Organic Rosa Canina (Rose Hip Oil), Panthenol (Vitamin B5), Xanthan Gum,Cassia Angustifolia Seed Polysaccharide (botanical Hyaluronic Acid), Organic Avena Sativa (Oat), Boswellia Serrata (Frankincense Essential Oil- for treatment, not smell), Wildcrafted Arnica Montana (Arnica), Organic Lavandula Angustifolia (Lavender), Organic Calendula Officinalis (Calendula), Organic Anthemis Nobilis (Chamomile), Vitis Vinifera (Grapeseed Oil), Macadamia Integrifolia (Macadamia Nut Oil), Wildcrafted Camellia Sinensis (Green Tea), Citric Acid, Sodium Carbomer, Phenoxyethanol, Ethyl Hexyl Glycerin.